It had snowed Dippin’ Dots!!! A car covered in The Ice Cream of the Future™ may sound like a dream come true, but Sr. Grace Marie is very particular about the car, and all that sugar didn’t sound like it could possibly be good for the paint job. Luckily for her (though certainly a blow to the kids across San Antonio who thought school was cancelled and they could eat ice cream all day), further investigation proved it was not in fact a sugary dessert, but plain ol’ graupel. Mia couldn’t figure it out either, though she tried sniffing, pawing and munching her way through the strange stuff. 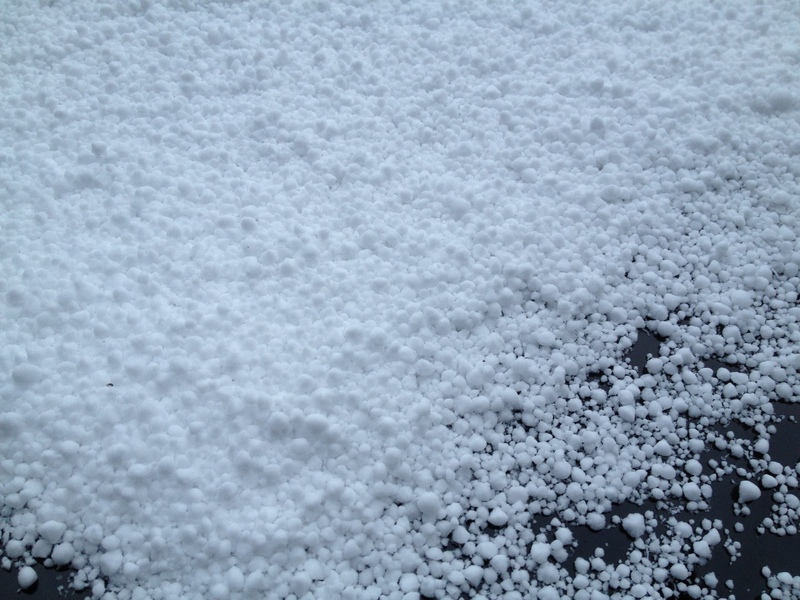 Turns out graupel forms when super cold water droplets land and freeze on falling snowflakes. We had never heard of it, or seen it, before this morning. Did we feel cheated to learn that not only was it not ice cream, it wasn’t even snow? Heck, yeah! And school wasn’t cancelled either. Nevertheless, we’ll continue to enjoy our cold weather and pray for the warmth and safety of all who are dealing with the hassle of real snow this winter. May God keep you safe and sane until the spring thaw. This entry was posted in A Nun's Life and tagged Dippin Dots, graupel, ice cream, snow, winter by srelizabeth. Bookmark the permalink. We are still digging out (have had about 30 inches so far) and have more snow forecast for Sunday. It looks beautiful as it falls but not when we have to shovel. Keep Warm. We are praying for y’all! Hope you have plenty of hot chocolate on hand. Well, it wasn’t exactly like that, more like little styrofoam pellets with no taste at all. No graupel when y’all come to Texas, it will be the other weather extreme by then. So you have a pet dog! Weather is looking good for the next week! At least here in SA….